R Michael Broyde / More than a decade ago, I was giving a large public shiur in a shul on a topic I had just written an article about (I think it was about celebrating Thanksgiving) and, when it was over, a person approached me, smiled sweetly, and told me that “I was much less impressive in person than in writing.” In truth, I was taken aback by the remark, but over time, I have grown to understand the truth of the observation. My primary method of sharing my understanding of many different aspects of halacha is in writing, and I do that better than I do almost anything else. The written word, I have discovered is more precise, elegant and fine tuned than any other method of communication available to me. More than a decade ago, I was giving a large public shiur in a shul on a topic I had just written an article about (I think it was about celebrating Thanksgiving) and, when it was over, a person approached me, smiled sweetly, and told me that “I was much less impressive in person than in writing.” In truth, I was taken aback by the remark, but over time, I have grown to understand the truth of the observation. My primary method of sharing my understanding of many different aspects of halacha is in writing, and I do that better than I do almost anything else. The written word, I have discovered is more precise, elegant and fine tuned than any other method of communication available to me. On April 23 2012 I wrote a short article entitled “Protesting Without Coercing” on a topic related to coerced divorce (see here) and this article was subject to a mean spirited ad-hominem by Rabbi Dovid E. Eidensohn (it can be found here). Like much of the dialogue that occurs in our community, his reply is short on substance, but full of vile language. I suspect that I could write a full blown reply if I wanted to but, as I have told many, I do not expect to reply further. My friends have been befuddled, and I write this public letter to explain my decision not to reply further and to be silent. First, these types of polemical replies – full of words like “slither,” “brazen” “bald lie” and “completely wrong” – almost always misunderstand (accidentally or blinded by zeal) my writing in a significant way. Polemical writings aiming to score points almost never are connected to tight reasoning or an honest assessment of the strength of their own case. This type of writing then becomes a tool to attract hits on the internet and not to discover the truth of Jewish law. Second, I have little desire to fight with another Torah scholar over whether he is right or wrong in a particular case; the discerning reader has seen two views and can figure the matter. It is better that I should be mochel any kavod hatorah that ought to be mine than to respond in a way that undermines kavod hatorah generally. I try to respond to all those who have written to me, publically when written to in public, and privately when written to in private: That is the give and take of Torah, and it is what makes halachic Judaism authentic. There is no failure in kavod hatorah when responding to criticism. But the name calling and vilification found in the matter at hand makes it hard to respond other than in kind, and doing so undermines the general principles of kavod hatorah. I simply cannot bring myself to diminish the honor of Torah. My third reason is more selfish. My time is precious, particularly since it would otherwise be used for progressing in personal Torah learning. If I were to stop my learning and respond in kind to this letter, there certainly would be a response to my reply, and the volleys back and forth would continue in a very non-productive way. It is better that I should continue to learn and grow in Torah than to roll in the mud in an endless volley. So, I have come to the conclusion that I am better off being silent. I hope the silence can be heard clearly. Was I hurt by this type of reply? Of course. Do I wish articles with this type of tone would not be written? Certainly. Is this tone good for our community? For sure not! Should I reply? No. So what will I do? I will cry on Tishah Be’av, mourning for what has become the nature of Torah discourse within our frail Orthodox community, and understanding better why the second Beit Hamikdash was destroyed. The tone of the opposing essay speaks for itself. If someone were to attack my own published work with this kind of language, I also would not respond. Actually, given who else he vilifies, I would be complimented to be in that club. I’m not zokheh. But what a downfall from when that blog posted positions from rishonim that aren’t covered in what we teach of aggadita, or when he focused on trying to help victims of abuse. It never ceases to amaze me how “religous” people can justify coarse, arrogant and insulting language about people with whom they disagree. Sadly, this is often then justified on the basis of great Rabbis in the past who also succumbed to this human weakness; and, worse, as defending true Torah. Because I am as human as everyone else, I also pause when I say אֱלהַי. נְצר לְשׁונִי מֵרָע וּשפָתַי מִדַּבֵּר מִרְמָה to remind myself that words matter. There is only one reason you should not reply to Rabbbi Eidensohn: Becasue he is an angry, arrogant, hothead who has disqualified himself from Torah dialogue and invalidated his legitimacy with these and past diatribes. Is not this post a type of reply? I have a better reason why it’s not worth arguing with Dovid Eidehnson: He doesn’t know what he is talking about. He makes bombastic statements that are totally out of line with the way contemporary poskim address the issue of ‘mais alai’. See Rav Shlomo Dichvosky’s article in Techumin for a good example. Sorry but the first few lines of the first paragraph required me to stop reading. I’m very disappointed. I gather you are against the sharp language which occurs in debate between Torah scholars such as Rav Shlomo Millers letters concerning Rav Belsky and Rabbi Broyde and Rav Aaron Schechters letter regarding Rav Belsky. 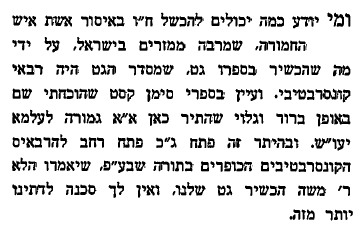 Rav Moshe Feinstein was also subjected to this type of language. 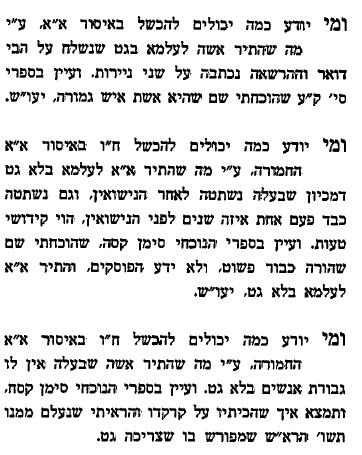 And of course you find it in Chazal and the Rishonim as well as in the Achronim. Personally it makes me question whether the goal of the writer (in all cases) is to find the emet or to be victorious. In an issue about mamzerut, the side that feels that he protects children against the worst kind of child abuse has a certain right to be forceful. To ignore the message is fighting against a style, which you may have a point, but to remain ignorant of the substance being discussed is also wrong. So in general if the halachic points on both sides are clear, I agree that being amongst the silenced is the correct course, if not, then ignore the chaff and deal with the wheat. On the other hand, when Rav Henkin strongly disagreed with Rav Feinstein’s ruling permitting civilly married women to remarry without a get, he wrote a long halakhic treatise on the subject but never attacked R. Feinstein. Another important point is that you have to be of a certain standing to use harsh language. If R. Miller wants to use this language with R. Belsky, that is his choice, but all of us on the sidelines have to respect both sides, and we can’t use this language. No disrespect to Rabbi Dovid Eidensohn, but he is not of the level to be using such gutter language about gedolim such as R. Schachter and others. It says something about him, that he feels that he is in their league and can speak to them that way instead of asking questions in a respectful manner. Also, I don’t think it is concern over mamzerut that is motivating Rabbi Eidensohn to speak this way. Since so many poskim have permitted the actions he criticizes, yesh mah al lismoch. I think it is obvious that he is a rabble rouser and wants to get “in the game”. That is why he is mixing into this issue that has nothing to do with him. Who appointed him to oversee all gittin disputes in this country? Who *is* R DOVID Eidensohn? That blog was kept by R DANIEL Eidensohn. He looks to be of an age, but has a different face – are they brothers? cousins? did he steal his brother’s password? does RDE approve of what RDEE posting? who is Dovid Eidensohn? I never heard of him before. By the way, that blog is the type that is overloaded with shtick and has caused my computer problems. Just a heads-up. Yasher Koach to R Broyde for his measured post. The same demonstrates that RYBS’s legacy of not responding to verbal and written brickbats is alive and well. A bit of Google-searching, and I begin to see. RDEE is indeed RDE’s brother. Where RDE is moderate, RDEE is argumentative. He writes and speaks against all the perceived social ills in the world – feminism, the gay lobby, now get protestors. He has a number of websites on various topics, filled with his writings. http://www.jewhaters.com/ – has links to a variety of his other websites, including a new one featuring his writings in his crusade against R Broyde. It still leaves the question of why he’s posting on his better-known brother’s blog in a manner almost entirely unlike RDE’s normal style – did he steal the password? does RDE agree with him? does RDE just want to stir up debate and interest, so he brings in his brother as guest blogger? Motivations are hard to know. Gil, RMi – you guys know RDE, maybe you could ask him what’s going on? Dr. Daniel Eidensohn doesn’t seem to realize the damage this is doing to his reputation. He’s turning into UOJ but without a just cause. I understand that he takes his brother seriously and therefore entertains questions about the legitimacy of R. Hershel Schachter’s positions, and he therefore believes he is providing a platform for public discussion of these issues, but he’s doing it incredibly irresponsibly. The fact that he is using a blog, on the internet, to make his arguments undermines him. Do great poskim today go online, on a blog/website, and start posting their views? This is still not the way that poskim debate issues. My recommendation to Rav Broyde would be, rather than responding publicly on a blog, write a full-length article for a halachic journal specifically discussing the issues raised by his previous post on get meusa and protesting. He could address the substantive criticisms and questions raised by the two RDEs, while also addressing other potential concerns. It seems that no one has written a full-length analysis of ORA-style tactics, and whether they would ever produce a forced get or contravene halacha in other ways, so I think it would be very useful to have. The RDEs are probably not the only ones who will ever be concerned about this issue. If Rav Broyde himself does not want to write such an article, other qualified rabbis interested in this issue could take this task upon themselves. Yeah, if they were really frum, they wouldn’t use the internet at all. Or even know what it is. Only the MO should be using the internet to promote their halakhic views. Rabbi Broyde congratulates himself on supposedly taking the high road, but in the mean time he hasnt answered a wit of R. Eidensohn’s crituque. In my experience, anyone who refers to an opponents criticism as “mean spirited” – as R. Broyde writes here -does so because he cannot legitmately counter the criticsim with anything of substance. We see it in politics, and now we see it here too. Whether R’ Eidensohn’s language is our cup of tea is subjective. Some may like, some may not. The same is true with R. Broyde’s passive-agressive style of writing, which is exactly the same as R’ Eidensohn’s, only covered with a transparently faux veneer of bonhomie. If R. Brodye thinks R. Eidensohn is wrong, let him show it. Yekov hadin es ha-har. In the meantime, when one sweeps aways R. Broyde’s polemics, he seems to be on the short end of the stick on this debate. Correct, which R. Broyde states explicitly! By the same token, poskim should be capable of defending their views in public forum, under open debate, without hiding behind the written word. Unfortunately, R. Broyde cannot. He is a good writer, with excellent computer searching and research skills. But he has no shikuul ha-daas, as that term has been understood for centuries. Lest Rabbi Brodye call me mean spirited for saying that – me, who woudlnt hurt a fly – let me just say a) who cares, and b) R. Broyde invites such remarks (and a lot stronger) by his repeated attempts to undermine tradition. Had he limited himself to teaching the uneducated no one would ever say boo. But he keeps tryint to foist his own personal politics on an orthodoxy that doesnt share them. His problem is that he holds himself out as some sort of 21st century posek, when he is nothing of the sort, not even close. The ability to mine a database does not a posek make. R. Gil – I know R. Broyde acknoweldges explicitly that he is not answering the critique. But that only highlights the problem. If he was capable of answering them, assuredly he would do so. That he doesnt is a clear indication that he cannot, and is using this sudden impulse to use the “high road” as a convenient excuse to duck the issue. Certainly not. It’s easy to respond to R. Dovid Eidensohn because he misreads many sources and forces them into his pre-conceived conclusion. But if you start playing in the mud with pigs, you’re going to get dirty. R. Broyde is wise to stay as far away from R. Eidensohn as possible. DF: Seriously, if you’ve ever seen R. Broyde speak in public, particularly when confronted by a hostile audience, you could never say that. I saw him speak about dina demalchusa dina and arkaos in front of a Flatbush crowd with some very hostile questioners and he owned the room. He’s quick on his feet and convincing with his arguments. He’s an excellent lawyer! Some would say that calling R. Eidensohn a pig, even metaphorically, is worse than anything he said himself. But I understand your point. All I can say is, if R. Broyde wants to dish it out, he should be able to take it too. He has the right to hide from criticsim on the grounds of being too genteel to handle it. But that way he is only going to preach to the converted, which is a pretty small group. If he wants to convince anyone, he will have to get down in what he thinks if the gutter, and argue. I like a lot of things about the modern orthodox viewpoint and I like a lot about the traditional viewpoint. So I’d be open to hearing R. Broyde defend himself. It’s pretty conspicuous, and damning, some would say, that he either does not or cannot. Who would say that using a common metaphor is worse, or even similar, to what R. Dovid Eidensohn said? I can’t be held accountable if people are uncomfortable with how languages work. That’s the point. He DID NOT dish it out! He is not hiding from criticism and if someone would respectfully ask him questions, he’ll answer. But you have to be smart and not get into an endless volley with a no-goodnik. Well, I actually did see R. Brodye speak in public, and it was on a subject near to my heart which I agreed with him on. It was on the need for prison reform, and R. Brodye was saying that very possibly a Jew would transgress mesirah by informing on another Jew, knowing how awful prison life is and what it does to a man*. It was a continuing legal education event, so he was darshening to a room full of lawyers. I wouldnt be as tactless as the person who actually said it to his face, but yes, he did seem rather less in person than in print. Does Rav Schachter similarly have a requirement to “Defend himself” against R. Eidensohn’s name callilng? It can’t be that everyone has to respond to every critique, no matter from whom and no matter how phrased. It could be that Rabbi Broyde should respond to good faith questions. But I think your charge of “undermin[ing] tradition” highlights that this argument is not about reading sources, but about underlying values, and that some people cannot be convinced of (or even respect, apparently) any argument that does not arrive at their prefered conclusion. I’m curious why Rabbi Eidensohn’s attacks merit even this public response, but not Rabbi Miller’s (worse) attack of last year. Agreed. Koheles already said it. And at some point you have to end it by saying “lo sevirah leih.” I guess the question is where one draws the line. I thought R. Eidensohn’s remarks were a tad crude, but otherwise perfectly ordinary. Again, R. Brodye does the same thing, just in a more modern, polished, passive-agressive style. Reasonable people can differ as to where the line lies. There is a story in Oro Shel Torah, a wonderful collection of stories about RSZA when he was at a simcha and a certain rav was called up for a kibud to the title of “harav hageon” and RSZA commented that he thought that the Tekufas HaGaonim had ended a long time ago! One can disagree with certain of R Broyde’s positions in print, but his articles always show great Lomdus, consideration of opposing views, and intellectual integrity and honesty while walking that fine line between the RY of RIETS and the LW of MO. As R Gil pointed out, R Broyde, whether in the Charedi heartland or in the citadels of MO, is never afraid to express his always well considered POV, even and especially when it is politically incorrect to do so. Steve- WADR, IIRC you’ve made those observations a million times already. The threads have moved on. Please move with them. I have also written in that vein here and elswhere. Neverthelesss, R Eidensohn’s comments were so beyond the boundaries of proper criticism and debate and degenerated into bashing of R Broyde and RHS that R Broyde’s best course of action was to ignore such comments, considering the source and the manner of the arguments expressed therein which caused more than a few readers to regret that they had ever read the same in the first place. Shaul Shapira-We disagree. I think that R Eidensohn’s comments constituted nothing more than a not so thinly veiled personal attack on R Broyde and his approach to Psak, wrapped in the well known and by now infamous comments of R S Miller. This post is a little misleading, because Rav Broyde did in fact respond (though briefly) to Rav Dovid Eidensohn’s critique. His reply is the last comment on the Protesting Without Coercing post. When Rav Broyde’s reply was posted on the Daas Torah blog, Rav Dovid Eidensohn refused to respond substantively to Rav Broyde’s response, saying only that it didn’t change his opinion “one iota.” So if anyone is refusing to respond to the other’s points, it’s actually Rav Eidensohn who dropped the ball (and who then switched targets and started focusing on his bewildering accusations that Rav Schachter is calling for violence against get refusers)! That said, as noted above I would like to see a full-length analysis of the substantive issues that have been brought up, though not in a public internet forum with Rav Eidensohn. You mean, I assume, that part of Orthodoxy with which you affiliate. The part that I affiliate with takes R. Broyde very seriously and shares many, if not most, of the positions he takes on matters important to the Jewish community. (I’m not exactly sure what you mean by “personal politics.”) And his manner of writing and speaking, the clarity of his explanations, the intellectual integrity he demonstrates and the lomdot which backs up his analyses makes that part of Orthodoxy proud of him even on (those few) issues where some might not agree with his conclusions. I second Joseph Kaplan’s comments. Where I come from, R. Broyde is looked upon with great respect, and his analyses taken extremely seriously. Although I should note that I ALSO come from a place where no one would DREAM of writing the sort of things about R. Schachter that we’ve been discussing, so what do I know? Publically calling respected poskim “resha’im” because you disagree with their positions on some important matters is a clear torah violation which should disqualify the proponent as a dayan. As R’ Gil intimated, instead of calling others “resha’im” he should look carefully into the mirror. Halachic rulings require goog sense and the careful weighing of issues, as well as book knowledge. A hothead doesn’t qualify. I’m disappointed that R’ Daniel Eidensohn has seen fit to post that diatribe and to enter the fray. Joseph Kaplan – Indeed, I was referring to orthodoxy at large, and not the narrow vein that would , apparently, view R. Broyde as a posek. We need not quibble over his qualifications, or what are the qualifications generally, if there are such, to be a posek. We are not capable of doing so, its unseemly, and its not necessary. It is simply a fact on the ground that the vast majority of orthodox Jews do not look upon him as one. In some ways thats a shame, because I think he has some good ideas. But with regard to ishus, the broader consensus to dismiss him is correct, in my opinion. He is an extremist (to the woman’s side) in all matters having to do with divorce proceedings, and only a fool of a man would agree to have R. Broyde’s beis din involved. By contrast, what I hear is that in pure business disputes where no idelogical issues are at stake they run a professional shop, akin to standard arbitration. The mussar message contained in R. Broyde’s communication is one that should be personally taken to heart by many of the frequent contributors to this web-site. DF-if R Broyde was “an extremist”, I tend to doubth that R Broyde would be a Dayan at the BDA. If R Broyde was viewed as “an extremist” on Agunos in the RIETS/RCA world, I tend to doubt very seriously that R Broyde would be serving as a Dayan at the BDA. Mair Zvi wins the thread. Touche. Steve – RSZA was not commenting on that particular Rav. In fact he did not want people to refer to himself either as a Gaon. He was commenting on the new minhag of those calling up at the chuppa to bestow legendary greatness on just about everyone. Even worse when a whole stream of Rabbanim are given kibbudim, but only one is singled out as a gaon oiker harim etc etc. Since the “narrow vein” you’re referring to is essentially the entirety of Modern Orthodoxy/Centrist Orthodoxy (whatever) – who, in those worlds, does not take R. Broyde seriously? – I’m not sure why this really matters. If there are non-MO types who don’t take R. Broyde seriously, that’s a pegam in them and shouldn’t bother others. still, their own members consistently dont use them. that can be interpreted in diff ways. for example, his extremism may not be extreme enough for them. nevertheless, the fact is the BDA does very very little dinei torah on matrimonial issues. they just do the get, and let the parties fend for themselves, in the vast majority of cases. thats why you have very little “disputes” in gitten cases by the BDA. The prior post was a response. He doesn’t have to keep responding again and again. Besides which, there are plenty of teshuvos and articles, particularly in the journal Techumin where these issues are grappled with due to the power of the Israeli Rabbinate. What I think Gil meant is that the (artificially promoted) first comment to the previous post directly responds to RDEE’s critiques. Beyond that, why continue to respond to someone who clearly doesn’t want to listen? BTW, the Gestetner fellow who Eideohnson keeps quoting is the same fellow who accused R. Ephraim Padwa, the Av Beis Din of Kedassia in London (roughly aligned to the Eida Hacharedis haskafahwise) of being mesader kidushin for an eishes ish. Needless to say, his views are not taken seriously anywhere. This isn’t a war against modern orthodoxy, it’s a war against sanity. That was exactly my point-RSZA was not keen on the abuse of such descriptions for rabbanim in general who were either not worthy of the same, which was consistent with his own refusal to be described as such. B’seder. Just say so . Why the high road bit? Because other people *do* want to listen. R Broyde and R Eidehnsohn aren’t the only people on the planet. Proof please? Perhaps, the use of the RCA PNA has led to a decline in Dinei Torah and litigation on such issues. Jon Baker: Yes, thank you for correcting my mistake. It is also the LAST comment on the post, so people don’t miss it. the RCA PNA would lead all such cases into the BDA. not a decline in Dinei Torah. (which is as it should be). i referred to the fact that the BDA almost never takes the litigation aspects of the case, leaving it to secular courts. they just do the get, without splitting the assets and without custody decisions. I think MiMedinat HaYam is wrong as a matter of fact. My sources tell me that the BDA does hundreds of even haezer dinai torah besides the get, as many frum couples sign the part of the prenup that gives the BDA authority over the whole divorce. On the status of Rabbi Broyde generally, I come from a yeshivish family in Brooklyn with a shul rabbi who — when I asked him about something relating to mesirah, told me to call Rabbi Broyde — and when I raised an eye to him as I told him that “Rabbi Broyde is not frum enough” he told me that there was no one in the United States with such a firm command of halacha and willing to answer hard modern shylas under 50. He told me that everyone knows that Rabbi Broyde is a “gavra rabba”. My experience talking to people is that people think he is very learned. I met him to speak about my mesirah question in Brooklyn where he was sitting with the Chabad Bet Din helping them with a chalitza. I responded to “Rabbi” Eidensohn when he posted on the Silver Spring Jewish list serve (I felt that I wasn’t lending him credence because I am not a rav). We had a little give and take. If you know someone who has access to the list serve they might be able to go back and find the give and take. It was around 3 months ago. My name is Dovid Eidensohn, and I am learning new things about myself from the comments here. I have responded to Rabbi Broyde’s attempt to portray me as someone who deals with vile language and no substance, just another one of his lies, as I put it on my brother’s blog. But I say to anyone here. Go to my brother’s blog and read carefully what I wrote about Rabbi Broyde’s support of ORA, in defiance of the Rashbo, Bais Yosef, Radvaz, Shach and Chazon Ish, and if you have any proofs that I am wrong, please enlighten me. Gedoleim Reb Aharon Kotler, Reb Moshe Feinstein, Reb Yaacov Kaminetsky and other gedolim of today and yesterday gave me oral and written haskomose of the very highest order. Now I have been reduced to a “vile” mouther with no substance. As I said, I made a website, getamarriage.com. Go there and to my brother’s blog and show that I have no substance and that I am only a vile mouther. I don’t know if this will get published, because I told off a certain person. I tell it like it is, and when you have no response, you call me names. I am still looking for a scholar of the first order to argue with, and so far, I am still looking. I spoke to a major posek from YU and he basically agreed with me. Thank you and ye’yasher kochakha, R. Eidensohn, shlit”a, for your valuable insights. As a token of appreciation to our Rosh Yeshiva R. Student, allow me to offer the following conciliatory compromise between R. Broyde, shlit”a, and yourself. I believe you are both enunciating truthful positions. Specifically, R. Broyde’s position is truthful in advocating the widespread use of a prenuptial agreement to prevent agunah scenarios (-I appreciate this wasn’t necessarily the sole purpose of R. Broyde’s original article but he did mention the point so I wish to capitalize upon it). The reason I say R. Broyde is correct in this respect is because his teacher R. J. David Bleich was publicly instructed by (le-havdil bein chaim le-chaim) R. Yaakov Kamenetzky at an Agudath Israel of America meeting convened to address the plight of the agunah that he (R. Bleich) should implement the prenuptial agreement he describes in Jewish Law Annual 1981 (later elaborated in R. Bleich’s Be-Netivot ha-Halakhah I, pp. 3-20) which awards a lady an extravagant daily allowance (tosefet mezonot), thereby preventing her from becoming an agunah. R. Kamenetzky was convinced that the use of this prenuptial agreement on a widespread scale throughout Klal Yisrael is appropriate for our time in Jewish history. So, we should all be listening to R. Broyde’s encouragement to employ a prenuptial agreement, for really R. Kamenetzky is speaking through R. Broyde in this particular respect. However, at the same time, it seems to me that you R. Eidelsohn are correct to challenge R. Broyde (with all due reverence manifest before R. Broyde), because the particular prenuptial agreement that R. Broyde advocates in his article is markedly different than that of R. Bleich, as R. Bleich explains in Be-Netivot ha-Halakhah I, pp. 21-31. R. Bleich demonstrates that the prenuptial agreement advocated by R. Broyde generates financial coercion against the husband and thus potentially disqualifies the resulting bill of divorce. [R. Bleich’s prenuptial agreement, by contradistinction, does not punish the recalcitrant husband, but rather rewards the wife – from the husband’s own free will – from the very beginning of the marriage.] I am currently preparing a new-and-improved version of R. Bleich’s prenuptial agreement (-since even R. Bleich’s proposal has been discovered to require a slight bit of diamond polishing, ve-ein kan makom le-ha’arikh), which will hopefully be ready for publication by the end of 5772. Stay tuned – “revach ve-hatzalah ya’amod la-Yehudim mi-makom acher”, and the agunah problem will soon be solved, be-chasdei Ha-Kadosh Barukh Hu, Yishtabach Shemo. Sometimes your attempts at “everybody is a tzadik and correct” are true, sometimes they are silly, and sometimes, like this time, they are so meaningless and wrong as to do harm. R. Broyde’s decision to desist from further debate with, to use RDE’s language, someone who deals with vile language, was, as he so often is, a wise one and you would have done well to follow suit. Thank you, R’ Joseph Kaplan. You are correct and I apologize. At the same time, R. Broyde did write (in a completely separate context, viz. his article on April 3, 2012 at https://www.torahmusings.com/2012/04/entry-into-a-church/ ) that “Inconsistencies between my views and Rabbi Bleich’s should always be resolved in his favor, as the poskim clearly state, that disputes between a student and a teacher are always resolved in favor of the teacher; see Sanhedrin 110a.” Therefore, it seems to me that by R. Broyde’s own admission, there is permission for R. Eidelsohn to challenge his advocacy of the particular prenuptial agreement he employs. Nevertheless, as you correctly state R’ Joseph Kaplan, the challenge should best be articulated in a respectful manner. R.Spira: No one ever said that R. Eidensohn does not have the right to challenge R. Broyde. The issue ALWAYS was R. Eidensohn’s vile and demeaning language. At least you agree with my brother on that point. I thank Mori ve-Rabbi R. Kaplan for his kind words and excellent guidance. The agunah question indeed inspires intense emotions, perhaps going back in history to the time when Naomi told Ruth “ha-lahen te’agena?” (Ruth 1:13). Hopefully, the light at the end of the tunnel will soon be here.